Sometimes it's hard to know what to eat to be healthy. MyPlate, USDA's new food pyramid, is a simple guide to help us out. The MyPlate guide is made up of five food groups: Fruits, Vegetables, Protein Foods, Grains, and Dairy. Notice how half the plate is full of fruits and vegetables. A smaller portion contains protein, like lean meat or fish. There's also grains, like whole grain bread, rice or pasta. And dairy, like milk, yogurt or cheese. Our plate at home should look similar to the MyPlate guide, except with real food of course. 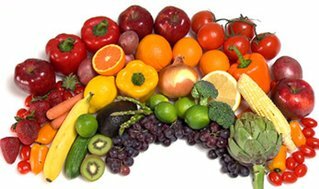 What Foods are in the Fruit and Vegetable Groups? Colorful fruits and vegetables of course. Fresh is best! But, fruits and vegetables may also be canned, frozen, or dried, and may be whole, cut-up, or pureed. 100% fruit juice also counts. Remember, half the plate should be fruits and vegetables. Fresh fruits and vegetables are packed with vitamins, minerals and nutrients that keep our body healthy and energized. They help fight disease too, protecting kids against cancer and other chronic illnesses. The brighter and deeper the color the better. Grains are divided into 2 subgroups: Whole Grains and Refined Grains. Whole grains contain the entire grain kernel ― the bran, germ, and endosperm. Some examples of whole grains are: whole-wheat flour, bulgur (cracked wheat), oatmeal, whole cornmeal and brown rice. Whole grain foods contain fiber, several B vitamins and minerals reducing constipation and the risk of heart disease, high blood pressure, diabetes and cancer. Refined grains have been milled, a process that removes the bran and germ. This is done to give grains a finer texture and improve their shelf life, but it also removes dietary fiber, iron, and many B vitamins. 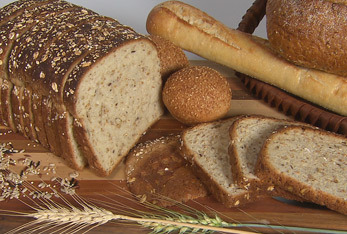 Some examples of refined grain products are: white flour, white bread, and white rice. For a healthy diet, make at least half of your grains whole grains. What are Protein rich foods? All foods made from lean meat, poultry, seafood, beans and peas, eggs, tofu, nuts, and seeds are considered part of the Protein Foods Group. A portion size for meat, chicken or fish is roughly the size of a deck of cards or 5-6 ounces. Notice on the MyPlate guide how one quarter of the plate is made up of protein. Eating protein rich food is important to be healthy. Our muscles, organs and immune system are made up mostly of proteins. Our bodies use protein to make hemoglobin, the red part of our blood cells that carries oxygen to every part of our body. Proteins also help build new cells and maintain tissues. A large part of the protein you consume each day goes into making enzymes, which are specialized worker proteins that do specific jobs, such as digest food and make new cells. As a general rule, between 10 percent and 15 percent of your total calories should come from protein. So, if you consume 2,000 calories per day, at least 200 should come from protein, or about 50 grams. Any food made from grains, preferably whole grains, like wheat, rice, oats, cornmeal, and barley. For example, whole grain bread, pasta, oatmeal, breakfast cereals, tortillas, and grits belong in the Grains group. Notice how one quarter of your MyPlate is made up of foods made from grains. To be healthy, make at least half your grains whole grains.